Transcription: Think it over. The Declaration of Independence was the direct result of taxation without representation. 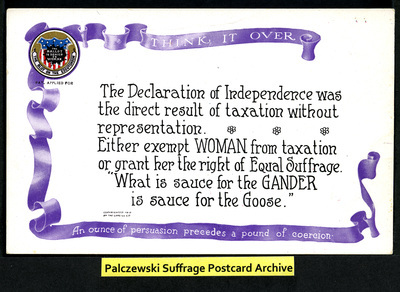 Either exempt woman from taxation or grant her the right of equal suffrage. "What is sauce for the gander is sauce for the goose." An ounce of persuasion precedes a pound of coercion.